Do you have a camera but aren’t sure what all those buttons do? Just what is aperture all about, anyway? How does shutter speed impact an image? What is an ISO? This basic photography class starts from the very beginning. It covers pressing those buttons on your camera. It presents hands-on practice to learn how f/stop is different from shutter speed and how they relate to each other. You’ll play with the rule of thirds and leading lines. You’ll learn fun tricks that bring life and interest to your images. The class is limited to 12 students. It is taught by Lisa Shea, an award-winning photographer who is the Vice-President of the Blackstone Valley Art Association. The cost per student is $30 for all four classes. That works out to less than $8 per class! This class is open to the public. It is critical that you register beforehand to reserve a seat. NOTE: THE CLASS IS NOW FULL. YOU CAN REQUEST TO BE PLACED ON THE WAITING LIST IF YOU WISH. The list of registrations we have are for Cindy | Mary | Robin | Fritz | Judie | Linda | Emile | Lori | Jay | Tracey | Lisa | Kelsey. If you want to read a little beforehand, you can read through our Photography Cheat Sheets. It’s fine to come in to the class as a blank slate. We are happy to start from the very, very beginning! I’m afraid this current one is full, but we’ll be holding more of them in the coming months! We’ve been running a series of workshops for photography topics. This Saturday morning 2/17 is on selfies and Sat afternoon is on abstract photography. 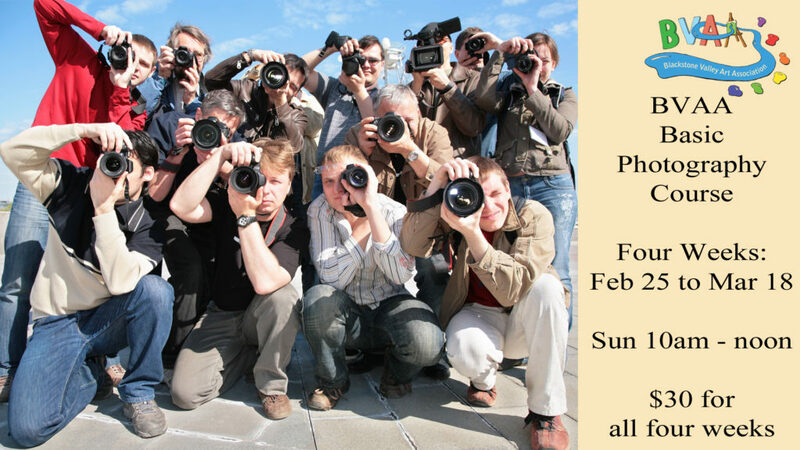 Next Saturday morning 2/25 is on portraits and Sat afternoon is on street photography. We’re planning out March’s schedule right now so if you have something you’re interested in, let us know! Any actually, But family photography is a definite. I have 3 grandkids 5,3 and 19 months. I love taking photos of them !